Sweetheart is a very scarce pattern known only in this cracker jar in green and marigold and a handful of marigold tumblers. 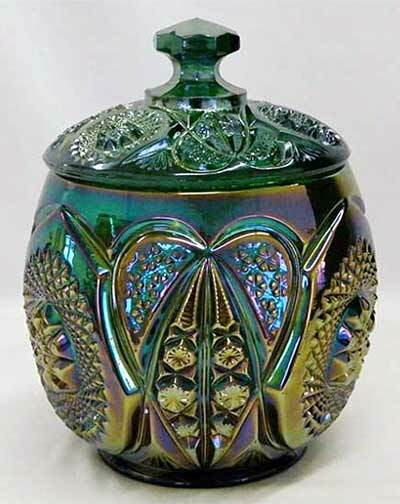 The only items to change hands recently were this green cracker jar with a minor nick on the lid that sold for $2,000 at the 2012 Texas Carnival Glass Club auction and another green example without a nick that sold at the International Carnival Glass Association convention auction in 2012, also for $2,000. Photo courtesy of Seeck Auctions. In 2013, a green example with nicks on lid and base sold for $700; a marigold version with minor roughness inside rim sold for $950. 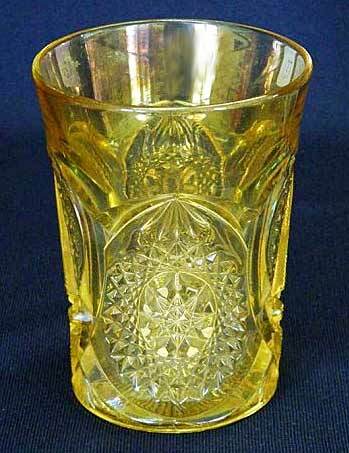 In 2013 this marigold tumbler sold for $425.